alaTest ha recogido y analizado 14 comentarios relacionados al producto Nikon Prostaff 7s Binoculars 10x30. En promedio, la calificación para este producto es 4.9/5, al ser comparado con la calificación 4.3/5 de otros productos en la categoria Binoculares. Analizamos las valoraciones de los usuarios y los expertos, la edad del producto y demás factores. 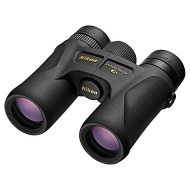 Comparado con otros Binoculares el Nikon Prostaff 7s Binoculars 10x30 recibe una alaScore™ global de 89/100 = calidad muy buena. A really good pair of binoculars that are nice to handle and being waterproof is a real bonus - excellent for the price. Brilliant ergonomics, incredibly stable, clear image and really light. Precisely what I wanted. Good case and lens caps which attach to the strap. Clear pin sharp sharp view. Easy to focus. Compact and light ensuring ease of use. A quality product. Bought these binoculars after looking at them and the Nikon prostaff 5 went for these as they where easier to carry when walking, first time I have ever had a decent pair of binoculars before, clear images,very impressed with focus (10x30). Hubby very, very pleased with them. Wished he had bought them years ago. Bought these for bird watching in the garden and they are great. Impressive clarity of magnification and not too heavy making them ideal and not a burden to carry out walking.